Steamboat Springs is nestled high up in the Colorado Rockies, where the town boasts beautiful mountain views around every corner and ample outdoor activities for the adventurous visitors. While Steamboat is certainly best known as a winter destination due to its renowned skiing, it's also a great vacation spot during the warmer months, when visitors can enjoy great hiking, mountain biking, and fishing. No matter when you decide to visit the charming town of Steamboat Springs, you should work with Vacatia to find the perfect vacation rental for your stay. It can be difficult to plan a vacation for a large group, whether it's for a big family vacation or a big ski trip with friends, but Vacatia can help make this process a breeze. Rather than booking separate hotel rooms for your entire group, consider staying at a large, spacious vacation rental that everyone in your group is sure to love. Vacatia can help you book your stay at one of the best five-bedroom condo rentals in Steamboat Springs, which means that your entire group can feel right at home in this beautiful mountain town. The Colorado Rockies are known worldwide for their dramatic, picturesque landscapes and their abundance of outdoor activities, which is why so many people travel to Steamboat Springs every year. 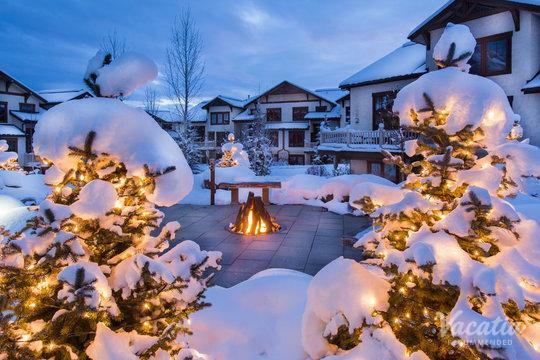 Whether you're planning a summer mountain getaway or a winter ski trip, you should work with Vacatia to book your Steamboat Springs accommodations. Vacatia can find you a rental property that feels more like a home than a stuffy hotel room, which is the perfect solution for traveling with larger groups. If you want to stay at one of the best 5-bedroom suites Steamboat Springs has to offer, simply rely on Vacatia to help plan you upcoming mountain escape. Not only do Vacatia's rental properties feature ample living space, such as extra bedrooms and a fully equipped kitchen, but they also boast the desired services and amenities of a resort. You can experience the best of vacation and the best of home during your Steamboat Springs getaway when you work with Vacatia. Steamboat Springs, often referred to simply as Steamboat, is a small mountain town in Colorado that is known for its cowboy culture, beautiful surroundings, and premier skiing. As a town with rich history, Steamboat Springs embraces its past and incorporates it into its present, which is why it's not unusual to see people in cowboy hats strolling around downtown or even skiing on the slopes. While Steamboat Springs is most popular for its snow sports, it's also a haven for outdoors enthusiasts during the summer. The area boasts ample outdoor activities in the summer, including white water rafting, fishing, and hiking. So no matter when you decide to visit Steamboat Springs, you should work with Vacatia to book your stay at the best five-bedroom condo Steamboat Springs has to offer. When you have a great home base in the Colorado Rockies, you are sure to enjoy every moment of your mountain getaway.